Listed in: Honeymoon and Israel categories. Get great rates to more destinations with America's fastest growing International airline. 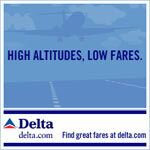 Book all your honeymoon flights and trips to Israel directly on Delta.com. Get more for your wedding! Don't forget to mention ChossonKallah.com when visiting Delta.